For many a Canadian child growing up in the 1980s, the Log Driver’s Waltz by Wade Hemsworth and the accompanying cartoon short created by the National Film Board of Canada are a classic slice of Canadiana. The premise of the Log Driver’s Waltz is that log drivers, who would typically drive felled logs down the river by using their balance and agile feet, could be compared to great dancers. While we were enjoying this cartoon in the Great White North, down in the US, Jamie Fischer was actually honing his logrolling skills. “We knew of the Log Driver’s Waltz in the US, but the more popular song for us was I’m a lumberjack and I’m okay by Monty Python,” he laughs. Fischer’s great grandfather was a lumberjack, and picked up logrolling, only to pass it on to his grandpa, then to his dad, then to Jamie. You might say that the Fischer family has a logrolling legacy. Fischer was encouraged to take his logrolling professionally, and started Lumberjack Enterprises, a company which serves to increase the popularity of lumberjack sports in local communities. Below, Fischer provides his five takeaways of logrolling. 1. The historical practice of logrolling was extremely dangerous. “Logrolling was traditionally a way to transport logs – essentially, after they were felled in the spring, the logs would be put in the water, and rolled down to the city. Competitions emerged when say, two opposing camps would finish for the day and see who was better or faster at logrolling,” explains Fischer. “At the time, log rolling was very dangerous – since it was the spring, the water was ice cold and there were risks of hypothermia. Literally, there would be chunks of ice floating in the water. Also, the logs were huge – if you fell, you could potentially be crushed between two logs, and drowning was very common at the time,” he says. Occupational safety was probably not at the top of everyone’s list then. Nowadays, competitions take place in fairly temperate places where there aren’t any waves, large boats or logs, or exceptionally cold water. 2. Logrolling is a predominantly east coast Canadian and Midwest American tradition. Not surprisingly, logrolling is popular in areas that used to or continue to be areas for heavy forestry activity. “The Midwest of the United States is probably 95% of the world’s logrollers. The west coast of the US has some, and Japan used to have some in the 1970s. But overall, you’ll find that most logrollers are from the Midwest,” says Fischer. 3. The best logrollers are either small and quick, or big and strong. “In order to win a logrolling competition, we’ve seen either those small people with quick feet to roll the log, or bigger people who have a lot of strength, who can control the log. However, we’ve noticed that people who compete in logrolling competitions usually weigh 200 lbs or under. That way, the log doesn’t just sink if they stand on it,” explains Fischer. 4. There is a whole host of lumberjack related sports. Within lumberjack related sports, there are two categories. Water events, and chopping events. 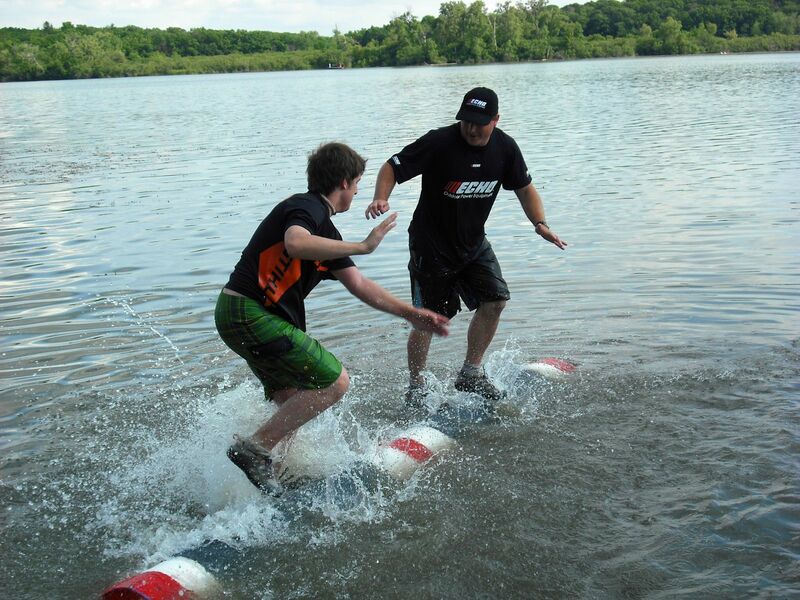 Birling, or logrolling, is one of these water events, while the other is boom running. “In log rolling, competitions involve two logrollers standing on a log and trying to roll the other off without going touching the centre line or touching their opponent– whoever falls off first, loses,” says Fischer. The booms were originally put in to build a barrier, or a giant bridge to prevent logs from scattering across the river. The other events are chopping events. There is an event to see who can chop down a tree faster, or nowadays, chopping a block of wood horizontally and vertically. There is also a ‘Crosscut saw’ event, where two people cut logs into specific dimensions or lengths, where the object is to cut a disk off of a horizontal log, forming a block that resembles a “cookie”, in the shortest amount of time. An event called ‘Hot Saw’ is similar, except competitors use saws with modified engines. 5. Logrolling, if you can find somewhere to do it, is physically and mentally challenging exercise. After Jamie Fischer finished college, he wanted to start his own company to increase the availability and popularity of logging programs, which turned out to be Lumberjack Enterprises. Since then, he has gone around the country introducing these programs at different community centres and universities. There, he trains staff and faculty, and then encourages them to take over the program. To date, he’s started 25-30 programs around the US. Learning how to logroll can be tough, though. However, those that do stay with it find that it’s extremely challenging, both mentally and physically. “It is a great form of exercise when you get the hang of it, and at the end of the day the camaraderie you build, and the people you meet are a lot of fun to hang out with,” he says. More information can be found at Lumberjack Enterprises and the US Logrolling Association.